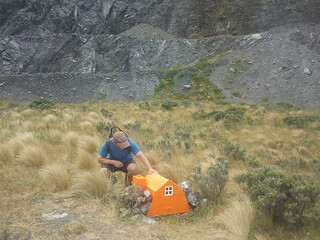 Earlier today, Eamonn and Steve and I checked out some of the Miniature Hikes huts that have popped up around Wellington, and which should be around until the end of March, with a parallel display in the Courtenay Place Light Boxes. It’s a very cool idea. The project has recently received some media attention, both in mainstream publications and also in some tramping and outdoor channels. The exhibition’s main website gives a better idea of what it’s about, as does a short YouTube clip in which the artists explain what they’re on about. 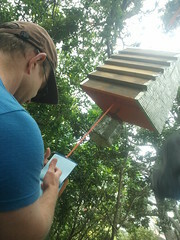 The mechanism has similarities to geo-caching, but is not the same. It’s certainly more fun than hanging around in a regular art gallery. If you’re keen to track these huts down, there’s a map at the end of the exhibition’s main web-page. The map also shows various other places where they’ve placed log books (without accompayning huts), just in case you feel the need to get out and express yourself. The whole thing is just a great excuse to get out and explore parts of Wellington when not out tramping. 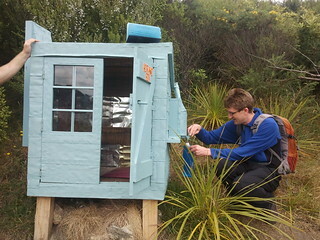 This entry was posted in musing and tagged art, huts, musing, wellington. Bookmark the permalink.